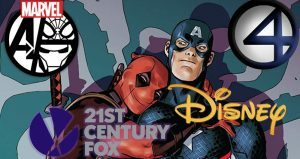 Fox Accepts Enhanced Disney Deal To Purchase 21st Century Fox Entertainment’s Assets! Could Marvel Cinematic Universe Now Include Deadpool, X-Men & Fantastic Four? Fox Accepts Enhanced Disney Deal To Purchase 21st Century Fox Entertainment’s Assets! Could Marvel Cinematic Universe Now Include Deadpool, X-Men and Fantastic Four? Disney really, really didn’t want to let Comcast have Fox. Walt Disney isn’t taking Comcast’s bid for 21st Century Fox lying down. A week after Comcast launched an unsolicited $65 billion all-cash bid for Fox’s entertainment assets, Disney returned with an amended agreement with Rupert Murdoch’s media giant for $71.3 billion, split evenly between cash and stock. Fox has now agreed to the proposal, calling it “superior” to Comcast’s offer, though that doesn’t stop other companies from making a bid. The deal still needs to be voted on by shareholders. The new offer shoulders Comcast’s bid out of the way as Disney looks to lock up Fox, which is home to marquee franchises like X-Men, Deadpool, Kingsmen, and Planet of the Apes; animated films like Ice Age; and TV assets like The Simpsons and edgy network FX. Disney’s raising of the ante underscores the increasing value of content, following AT&T’s $85 billion purchase of Time Warner. Comcast had hoped the Fox assets would join a stable of entertainment outfits that include properties run by NBC Universal. Think The Fast and the Furious and the Jurassic World movies, plus a constellation of TV channels — not only those that have NBC in their names but also others like Bravo and Syfy. Disney, meanwhile, could benefit as well from Fox’s wide range of television and film assets, which could feed into its streaming services, including a planned rival to Netflix sometimes referred to as Disneyflix. …Disney’s higher bid keeps the dream of a massive Marvel crossover alive. Disney, which owns the film rights to the Avengers, could unify the comic book universe by bringing in-house Fox’s rights to the X-Men and the Fantastic Four.